Foreigners who come to America don't see themselves as victims, that is why they get ahead. Many blacks hold a resentment towards foreigners who come to the United States and end up becoming far more successful then they have. About twelve years ago, I use to work with a guy who immigrated here from Nigeria. Me and him got into a conversation one day, because this guy use to work 12 hour days constantly. So I asked him why is it that he worked so hard. He told me that he wasn't afraid of hard work. He told me that back in Nigeria, he use to work harder then he did now. He said he came to the United States to better his life. I was amazed at what he told next. In the short period of time he was in the country which was about four years, he managed to buy a Mercedes and own three cabs with people driving for him. All the money he made he sent back home to Nigeria for his family. He had little respect for many blacks who were born here he told me, He told me point blank that he believed that a lot of blacks were complainers and were lazy but wanted everything handed to them, and it was crazy that he was able to come to this country and could barely speak English, yet he was more successful then blacks who were born into the opportunity this country provides. To this day, I've never forgotten what he said. He was right. Many blacks who were born as American citizens waste their lives blaming foreigners and whites for their short comings. I can honestly say that I've never hear of African immigrants in the United States claiming that. It's like I've always said. When you are taught that you are life's victim due to the color of your skin, why would you dare try to elevate yourself in life, what's the point right? Those who black and were never taught that don't have that victimization mindset, so they simply go out and succeed at life. This video I came across proves that perfectly. This exchanged happened about three years ago, but it's still relevant to this day. A self victimized black woman went into a convenience store and got into a heated arrangement with the owners of the store (who were African). The black lady for some reason didn't want to hear that the owners were from Africa. She was angry that they were in the United States and thought somehow they were stealing opportunities from blacks. Progressive intolerance in the name of tolerance? Liberalism and tolerance goes together like vampires and garlic. Progressives have been known to act in the hate filled manner they claim the right represents for decades. I discovered just how intolerant the left can be when Clarance Thomas was being confirmed by the U.S Senate for a seat on the Supreme Court. I didn't even know who the man was, but one thing that stood out during the process was how the left racially attacked him for no good reason. They called him an Uncle Tom, said that he wasn't black, he was an Oreo etc. The words he was called didn't make sense to me back then. I asked those who attacked this man, why did they refer to him as a "trader to his race". Of course, they couldn't answer that question. As I became more politically active, my thoughts about the left became more clear that these people who champion themselves as the advocates for tolerance, compassion and diversity are anything but what they claim. 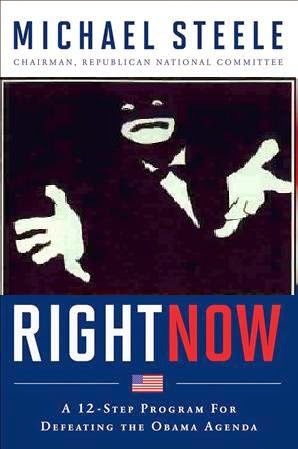 This is how liberals portrayed Joseph Lieberman when he ran for re election against fellow liberal Ned Lemont in 2006. Joe was under attack due to his support of the Iraq War and support of George Bush on the issue. 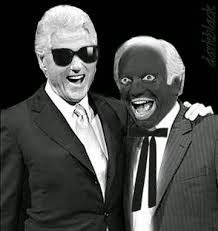 So a supporter of Lamont doctored a photo of Lieberman (in black face) standing next to Bill Clinton. Of course liberals just dismissed this, because they just hid behind the lame excuse that they couldn't be racist or bigoted due to them being liberals. When black conservative Ken Blackwell ran for Governor of Ohio, the left didn't take too kindly to that. 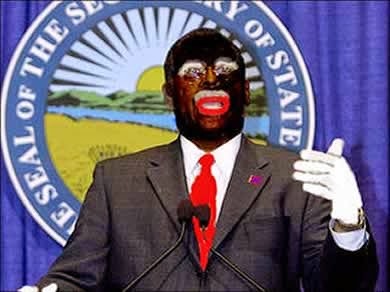 When Michael Steele ran for Governor here in Maryland, the left portrayed him as a "sambo", "minstrel". When he became the first black chairman of the Republican National Committee, the left wasn't interested in his historic achievement as a black man. 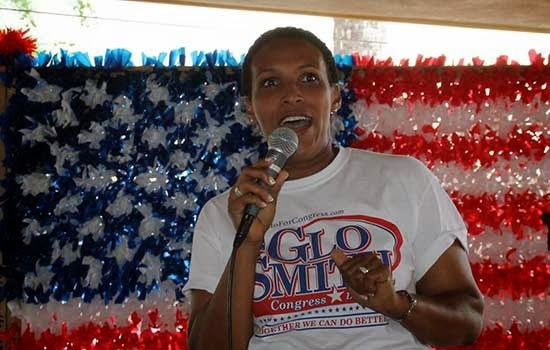 This is how the left portrayed Ms. Glo as a black female for daring to have diverse points of views that aren't shared by liberals. Now of course all liberals aren't racially hard wired like this, but the ones who aren't are fraudulent, when it comes to pointing their fingers at the right and shouting racism. Those on the left who truly embrace diversity including ideological diversity needs to ask themselves why other liberals feel that minorities are suppose to embrace their views exclusively or else. As a conservative who is black, I welcome other blacks who chose to be conservatives, liberals, moderates, democrats, republicans, libertarians, green party or constitutional party members or simply chose to be unaffiliated. Why do some liberals act out in a racial manner? Do they realize that every time they racially attack blacks for doing nothing more then opposing them on policies, they are making themselves out to be the real racists they claim the right is? 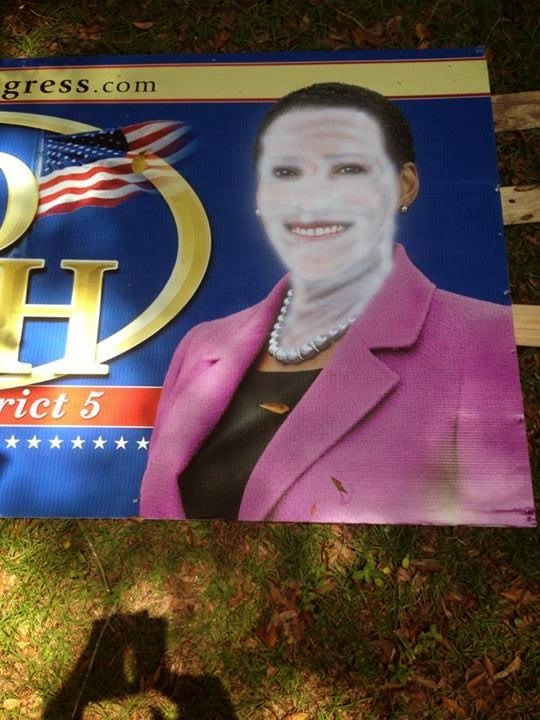 I remember some on the left calling Condi Rice an "Aunt Jemimah". I've asked liberals who called her this how does a a woman who was a child prodigy, who holds a Doctorate Degree, speaks 3 languages fluently, plays classical piano, was the former Secretary of State and National Security Adviser and is a college professor be compared to a fictional maid like black woman on a bottle of syrup. As you may have guessed, I have yet to get an answer. White Privilege and the indoctrination of American kids. I've been hearing this buzz term for awhile now. What exactly is "white privilege"? I suppose liberals would say that white privilege is something about whites in America who are privileged to have certain advantages because of the color of their skin. Well if that's the case, then from a progressive stand point naturally they are going to believe the flip side of that claim, that minorities are the inherit victims of "white privilege". As with progressive logic, minorities and blacks will always be life's victims due to whites somehow having it better then them. Of course that line of thinking is beyond stupid and irrational. Then again, if you are a progressive and your job is to convince blacks that their life sucking isn't their fault, then this is a perfect excuse to use. I was driving yesterday here in Baltimore, and I pulled up to an intersection. A homeless guy was walking the cement walkway divider looking for motorists to give him change. The guy was white. As I observed this guy asking for change I thought if white privilege is real, why is this guy homeless and begging for change? I've seen other homeless people who are white and are homeless, and that question never escapes me. On the flip side, there are blacks in this country who are very well off financially and in some cases are millionaires and even billionaires. So how did that happen? Dr Dre the rapper just recently sold his Beats Audio headphone company to Apple for I believe two billion dollars. Is that a sample of "black privilege"? What about Oprah who is considered the most powerful woman in media, well Oprah is black. Now I know some will say that I am naming entertainers, but my point is that the myth of white privilege is just that, a myth. Tell that to liberals though, and they will swear up and down that your are either a racist or out of touch Liberals are so engulfed into this insanity, they even have an annual "white privilege conference" to talk about how to combat "white privilege" in America. 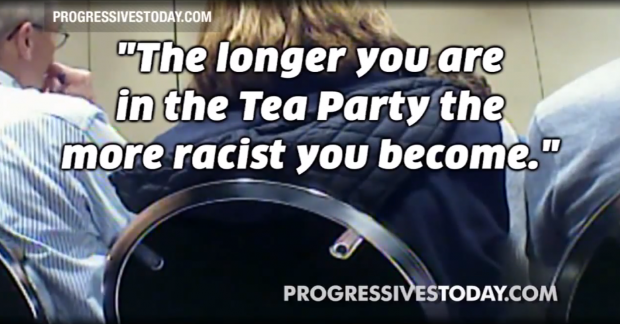 h/t to progressives today.com for shedding a light on how liberals are indoctrinating kids to believe such insanity. It has been said the liberalism is a mental disorder. There is little doubt that it is. This just shows that liberals have no idea what real racism is. Some of these kooks actually believe they are inherently racists simply for being born white. That is as mental as thinking that a person is destined to be drug user, dealer or criminal, because he was born black. Of course this is obvious brainwashing of kids. No wonder so many of them are growing up to be such mind numbed robots voided of being able to use analytical thinking. They are being programmed at very young ages to think this dribble as witnessed in at the White Privilege Conference. If I was to have brought up this topic, liberals would have just claimed I was making this stuff up, well let them argue with the facts now.This is obviously real and is most definitely happening. It's foolishness like this is a reason why the federal "Common Core" educational curriculum has been rejected by so many school systems via the backlash of parents from across the country, because they reject the social justice ideological BS which is the framework of it. So much for the days when educators were in trusted to just teach the children about reading, writing and math and science. The White Privilege Conference just verifies what I said about how liberals see blacks as being poor, pathetic down trodden victims. It's not their fault for anything. It's the fault of "the man". This type of thinking is also known as "White Guilt". If these ding bat liberals feel so bad for being born white, they can always jump off the nearest overpass and call it a day. Nah, no such luck. I've been called many derogatory names by the left, because I see through their warped minded insanity thus never seeing myself as a victim of "white privilege", because I never was. I would love for an "intelligent" liberal to tell me how I was and am. Good luck in that happening I now. While other countries are teaching their children advanced mathematics and science, kids in the United States are being brainwashed about "social justice" and white guilt. Gee, I wonder what nation is economically going to be better off in the long run? (sarcasm). I came across a beautiful video by a lady named Stacey On The Right in response to the 2014 White Privilege aka White Guilt Conference that just ended a few weeks ago. She nailed it perfectly.